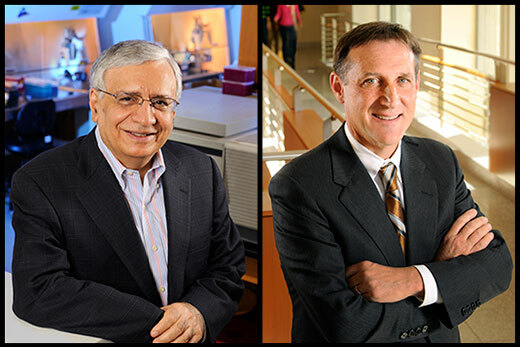 Rafi Ahmed (left) and Chris Larsen have been elected to the Institute of Medicine's newest class of 70 leading health scientists and 10 foreign associates. The Institute of Medicine (IOM) has elected Rafi Ahmed, PhD, and Christian P. Larsen, MD, DPhil, to its new class of 70 leading health scientists and 10 foreign associates. Rafi Ahmed is director of the Emory Vaccine Center, a Georgia Research Alliance Eminent Scholar, a scientist at Yerkes National Primate Research Center, and Charles Howard Candler Professor of Microbiology and Immunology in Emory University School of Medicine. Chris Larsen is dean of Emory University School of Medicine, vice president for Health Center Integration for Emory’s Woodruff Health Sciences Center, chairman of the Board of Directors of the Emory Clinic, and Emory Healthcare Physician Group President. He is a professor of surgery in Emory University School of Medicine and an affiliate scientist at Yerkes National Primate Research Center. Election to the IOM is one of the highest honors in the fields of health and medicine, and recognizes individuals who have demonstrated outstanding professional achievement and commitment to service. New members are elected by current active members through a selective process that recognizes individuals who have made major contributions to the advancement of the medical sciences, health care and public health. “I am extremely proud of this outstanding accomplishment by two of Emory’s most distinguished health sciences leaders,” says Wright Caughman, MD, executive vice president for health affairs at Emory University, CEO of the Woodruff Health Sciences Center, and chairman of Emory Healthcare. As fellow immunologists, Ahmed and Larsen have collaborated on long term research projects in Emory School of Medicine and Yerkes Research Center aimed at refining and targeting the immune response in animals and humans to fight infectious diseases and cancer and to improve organ and tissue transplantation. Rafi Ahmed, a member of the National Academy of Sciences, is a world-renowned immunologist whose work has been highly influential in shaping our current understanding of immunological memory to viral infections. His seminal work has defined the cellular basis of T and B cell memory and these findings are now providing a framework for the rational design of new and more effective vaccines for prevention and treatment of disease. Ahmed’s laboratory was also involved in developing a method of rapidly generating human monoclonal antibodies after vaccination or infection and demonstrating that humans can produce broadly cross-reactive antibodies that recognize multiple strains of influenza viruses. This research has led Ahmed and others closer to the goal of developing a universal flu vaccine. Ahmed has made groundbreaking discoveries on T cell dysfunction during chronic viral infections. His work identified the underlying causes of T cell exhaustion and showed that blockade of the PD-1 inhibitory pathway can rejuvenate exhausted T cells and reduce viral load. This game-changing finding has been highly influential in the clinical development of PD-1 directed immunotherapy for the treatment of human chronic infections and cancer. Under Ahmed’s continuing leadership, the Emory Vaccine Center is now one of the largest, most comprehensive academic vaccine research centers in the world, with more than 30 faculty and a research staff of nearly 250, laboratories in New Delhi as well as Atlanta, and more than $650 million in research funding over the past 18 years. The Vaccine Center’s research spans the entire spectrum from fundamental laboratory science, to nonhuman primate studies, to clinical trials through the Hope Clinic, to public policy initiatives. Ahmed received his undergraduate degree from Osmania University in Hyderabad, India, an additional bachelor’s and master’s degrees from Idaho State University, and a PhD from Harvard University in 1981. He was a postdoctoral fellow at Scripps Clinic and Research Foundation (1981-1984) and joined the faculty of the UCLA School of Medicine (1984-1995), rising from assistant to full professor. In 1995 he joined Emory University School of Medicine and Yerkes National Primate Research Center as the founding director of the Emory Vaccine Center. He is a fellow of the American Academy of Microbiology, the American Association for the Advancement of Science, and the Indian National Academy of Sciences. Chris Larsen, an internationally recognized leader in transplant surgery and immunology, joined the Emory School of Medicine faculty in 1991 and was appointed Chair of Surgery in 2009. His clinical practice is focused on kidney, pancreas, and islet transplantation at Emory University Hospital and Children’s Healthcare of Atlanta. He is also an affiliate scientist at Yerkes National Primate Research Center. Larsen became founding director of the Emory Transplant Center in 2001, building and directing one of the foremost research and clinical transplantation programs in the world. The center is most noteworthy for its leadership in the early integration of clinical care and research. In 2003, he and his team performed the first islet transplant in Georgia and have continued to be leaders in this innovative field of transplant. Under Larsen, the Emory Transplant Center has been a national pacesetter in establishing new standards to ensure reliable, patient-centered care, focusing on multidisciplinary care a full decade before its recognition as an essential attribute in patient care. In addition, it has been one of the nation's leading centers for National Institutes of Health research funding in basic immunology, in translational studies in non-human primates, and in large, multi-center clinical trials. Together with long-time collaborator Thomas Pearson, MD, DPhil, Larsen has played a pivotal role in developing a new class of immunosuppressive drugs, the co-stimulation blockers. Poised to replace the cyclosporine class of drugs, these new drugs have the promise of being just as effective while avoiding the major side effects and toxicities associated with cyclosporine. Larsen and Pearson helped drive discovery and development of the co-stimulation blocker belatacept, approved in June 2011 by the FDA for kidney transplant recipients—the first time a new class of drug had been approved for transplant since the 1990s. After receiving his bachelor of arts in chemistry from Emory College, Larsen received his medical degree from Emory University School of Medicine in 1984. He was a Livingston Surgical Research Fellow at the University of Oxford, England, and he received his doctor of philosophy in transplantation immunology from Oxford in 1990. He completed general and transplantation surgery training at Stanford University and at Emory, where he was chief surgical resident and a fellow in transplantation surgery. The IOM is unique in its structure as both an honorific membership organization and an advisory organization. Established in 1970 by the National Academy of Sciences, IOM has become recognized as a national resource for independent, scientifically informed analysis and recommendations on health issues. With their election, members make a commitment to volunteer their service on IOM committees, boards and other activities. The newly elected members raise IOM’s total active membership to 1,798 and the number of foreign associates to 128, with an additional 86 members holding emeritus status. With the election of Ahmed and Larsen, Emory currently has 25 members in the IOM. View more information about the IOM and its new class of elected members, see the National Academies web site.